Level of capacity utilization achieved in the US manufacturing sector in February, according to the monthly report from the Federal Reserve. That is the highest level since December of 2007, and tantalizing close to the long-run average of 78.8%. We've been moving towards that level since the bottom hit in June, 2009, when the measure reached a record low of 63.8%, but keep pulling back when utilization creeps over the 78% line. Rise in China’s 2012 exports to the US of high-tech electronics, auto parts and optical devices, to $129 billion, while exports of clothes and footwear rose just 5% to $47 billion. Rising labor costs - as well as a deliberate government strategy to move to higher value-add products - are behind the change. Despite those cost pressures, HSBC economists estimate that China's share of global exports increased to 11% last year, from 9% before the 2008 financial crisis. China's exports rose 8% last year, while global trade expanded just 1.6%, according to the Netherlands Bureau for Economic Policy Analysis. The beat goes on. 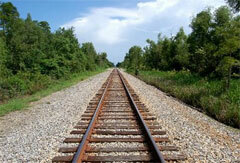 Amount of capital investments by US railroads expected in 2013 - the third consecutive year of record capital outlays and more than double the $5.9 billion the rails spent a decade ago. The Wall Street Journal says that these huge investments are not about network expansion so much "about a race to make existing rail lines more efficient and able to haul more and different types of freight." What is especially interesting about this scenario is that from the 1970s to 1990s, rail carriers had among the worst returns on invested capital of any industry sector in the US. Not anymore. Miles per gallon achieved in tests by the new "SuperTruck" in development by engine maker Cummins and tractor producer Peterbilt, according to an announced last week. Terrible by normal car standards, achieving that level diesel miles per gallon would actually be a huge breakthrough in the industry, increasing current mileage performance by more than 50% versus current averages. Cummins is a prime contractor in developing under the U.S. Energy Department’s SuperTruck program. The gains come from changes to the engine and truck aerodynamics. More testing is coming.